Hamilton says that pictures posted online yesterday that show him in compromising poses with women while seemingly drunk at a bar are real and were taken in Tempe Arizona in January. The sporting website, Deadspin.com posted pictures on Saturday morning of Rangers all-star outfielder Josh Hamilton, seemingly drunk in an Arizona bar, surrounded by a variety of women and in a variety of provocative poses. Hamilton, who has made headlines for his recovery story and success on the field, admitted yesterday that the photos posted were real and were taken on a January night after a day spent preparing for spring training at the Athletes Performance Institute in Tempe Arizona. He admitted to an alcohol relapse, and though he has spent much time preaching his story of recovery through Jesus Christ, he said, "I don't feel like I'm a hypocrite. I feel like I'm human. I got away from the one thing that keeps me straightened out and going in the right direction." Hamilton was chosen as a first round draft pick in 1999 by Tampa Bay. By 2004, alcohol and drugs had derailed his career and he spent 3 years away from baseball, finally making it back with Cincinnati in 2007 after having had his “last drink” in October 2005. His dramatic comeback successes (he led the league in RBIs last year), his humility and his openness about his past endeared him to many baseball fans, who appreciated his candor and his heart warming story of genuine recovery. Hamilton told reporters that he admitted to his slip with alcohol the day after it happened to his wife, his family and to the Rangers organization. He says that although “he hates that this happened” that it shows how ever present the battle to stay sober remains in him. Describing how it happened, Hamilton said, "I went to get something to eat. Obviously, I eat at restaurants that have bars in them all the time. I wasn't mentally fit to go in there, spiritually fit, and it just crossed my mind, 'Can I have a drink?' Obviously, I can't." Hamilton told reporters that he was embarrassed about the incident. 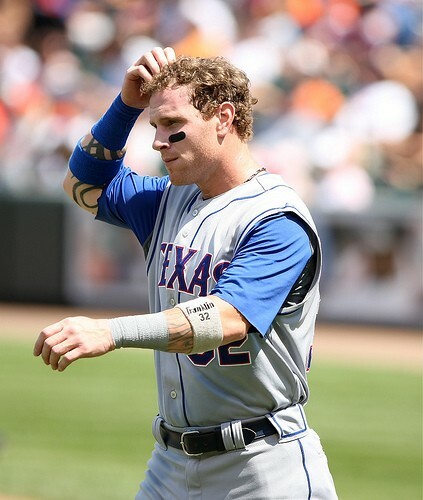 The 28 year old breached no rules of the Ranger organization or MLB and will face no career sanction.